A Great Big Race Announcement! | Keep It Up, David! …but I’m announcing it now! I’ve signed up for a stair climb in an iconic building that’s recognized all over the world. Want a hint? 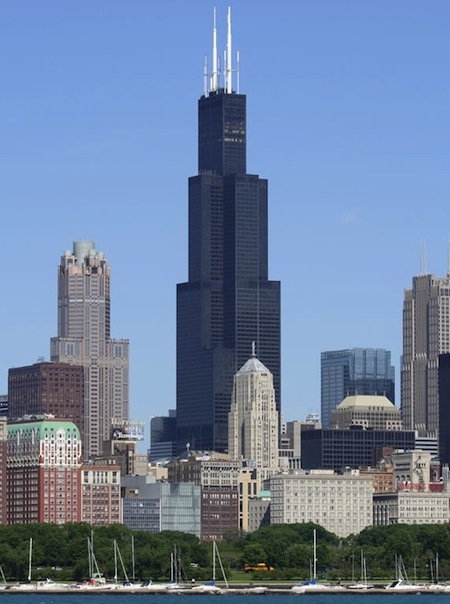 Formerly known as the Sears Tower, this Chicago skyscraper was, up until One World Trade Center opened earlier this year, the tallest building in the United States – a record it held since it opened in 1974. Even though One World Trade Center is technically taller (thanks to a taller spire), Willis Tower still has the highest roof in the country, as well as the highest occupied floor (Willis has 108 stories; One World Trade Center has 104). It’s an incredible building, and as a frequent visitor to Chicago, one I’ve seen a lot. 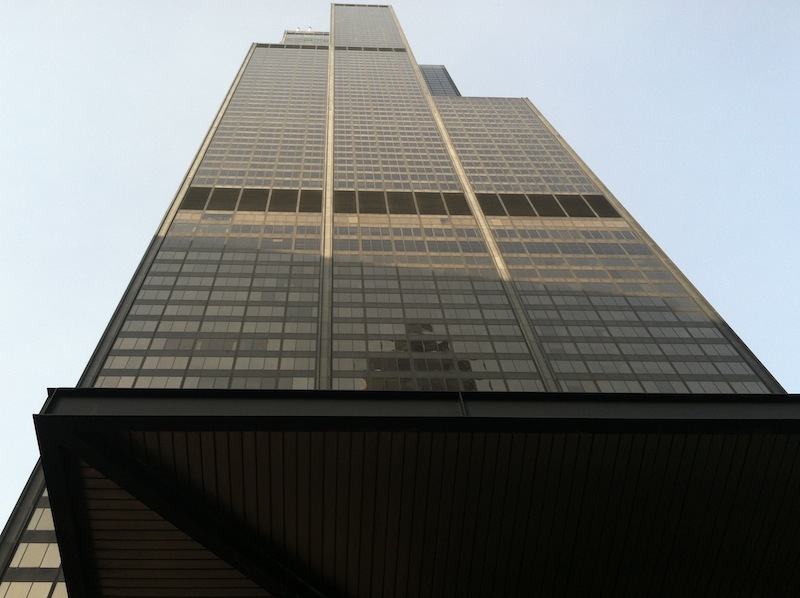 My sister Laura and I went to Willis Tower a couple years back (read the post here), and up close it’s massive. 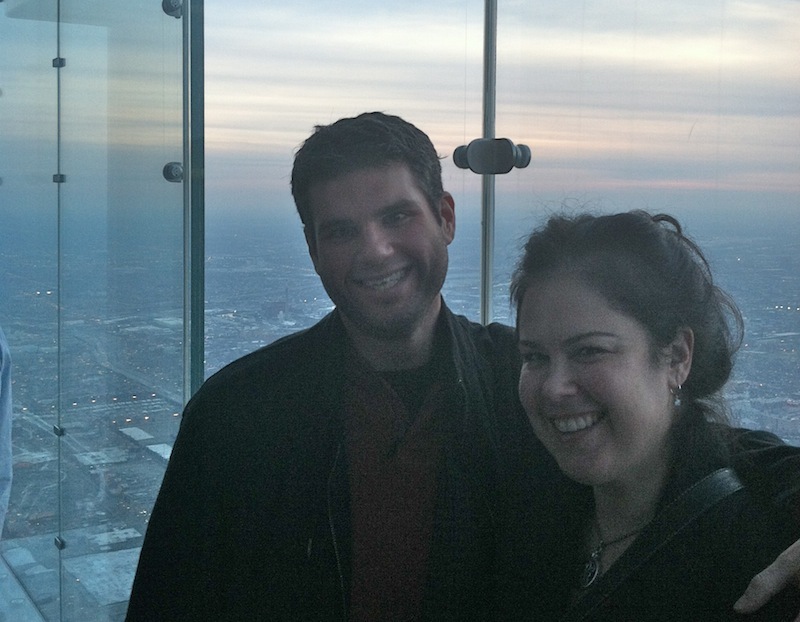 Laura and I went to the Skydeck, which is the observation deck on the 103rd floor. The views are amazing – you can see four states on a clear day! 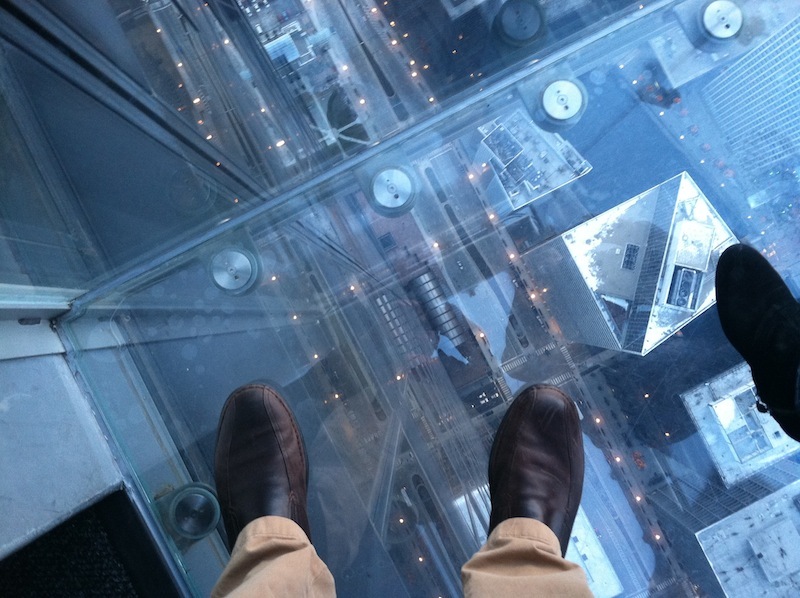 There are glass cubes protruding from the building, and if you stand in one, you can look down, past your feet, and see the ground, over 1,300 feet below. It’s a one-of-a-kind experience. And now that prediction is coming true! SkyRise Chicago is a race from the sidewalk to the Skydeck on the 103rd floor. It’ll be by far the tallest building I’ve raced up, with 2,115 steps (my current record is the 75-story US Bank Tower in LA, which has 1,664). RELATED CONTENT: Read about ALL my stair climb races on my Races & Events page! It’s happening on November 2nd – just over two months away! I’m very excited to add another building to my resume, so to speak, but there’s a more pressing race that comes first. The YMCA Stair Climb For Los Angeles is now less than a month away. That’s the race in the US Bank Tower – read my recap from last year here. And that brings me to the awkward part… asking for money. All four of the races I’m doing this fall are charity races, and each have a fundraising minimum (varying from $100-$150) that I need to reach before I can compete. I’m gonna do my best to not be obnoxious about fundraising, but these races are important to me, and they all benefit great causes. If you could spare a few bucks, I’d greatly appreciate it. If you could spare a lot more than a few bucks, you’d be my hero! 9/19/14. YMCA Stair Climb For Los Angeles (at US Bank Tower, downtown LA). Benefits the Downtown-Ketchum YMCA. DONATE HERE. 11/2/14. SkyRise Chicago (at Willis Tower). Benefits the Rehabilitation Institute of Chicago. DONATE HERE. 11/15/14. Los Angeles CF Climb (at Figueroa@Wilshire, downtown LA). Benefits the Cystic Fibrosis Foundation. DONATE HERE. 12/13/14. Orange County CF Climb – Hike the Halo (at Angel Stadium). Benefits the Cystic Fibrosis Foundation. DONATE HERE. I’ve been training a lot lately (in skyscrapers, at the Rose Bowl, on public stairways) and I have more training to do before September 19th. I’m looking forward to getting back in the Wells Fargo Center (I haven’t been in almost two weeks), and have a couple other new training venues in mind, too! This entry was posted on Monday, August 25th, 2014 at 12:01 am and is filed under Uncategorized. You can follow any responses to this entry through the RSS 2.0 feed. You can leave a response, or trackback from your own site. 5 Responses to A Great Big Race Announcement! Yay David!! So excited you are coming to Chicago! I’m terrified of towers with glass floors! Just the idea of nothing below is scary! Congrats on the ALS Ice Bucket Challenge! Thank you. And I’m so glad I don’t share that fear! I’ve been reading your blog on and off for a while because I like reading blogs by other stair climbers. Anyway, I’m excited to see that you are doing Skyrise Chicago! If a woman randomly approaches you and asks if you are David, it’ll probably be me. This will be my second time climbing the Sears/Willis Tower, and I’m quite excited.